The beginning of March! You know what that means for me, right? Time for yet another attempt at diet and exercise. Hey, I'm nothing if not consistent. Consistently inconsistent, that is. So I had a revelation. Or, in Oprah-speak, a "light bulb moment". Whenever I combine dieting and exercise, there's a part of my brain that rationalizes: "Hey, I worked out. I can eat more." So I do. And then shockingly enough, I struggle mightily to lose weight. Because not only am I building muscle, I am pretty much NOT eating in moderation. Because I'm starving from exercising. Remember when I did the Shred for 30 whole days back in September? I came out of that more toned, yes, but the underlying problem still remained/remains: I NEED TO LOSE WEIGHT. And then I read this post of Lena's. "Diet for weight. Exercise for shape." So I have come up with a new strategy. Right now, I'm solely dieting. Strictly counting calories, and writing everything down. And ready to gnaw my arm off because I'm so damn hungry. I'm not giving myself exercise to fall back on as an excuse to eat more. So far, it has worked. I'm down 4.4 pounds. (Hello, water weight!) But it's at least a step in the right direction. Seeing those numbers decrease does WONDERS for my motivation. But yes, I know I know I know that I need to exercise. That exercise is an important factor in overall health and well-being. Especially my well-being. After March 14 (daylight savings, holla! ), I will begin running again on a regular basis. I will get home from work around 5 and immediately go for a run. Hubby and I have already worked this out. I had a little breakdown this weekend about my weight and when Hubby asked how he could help, I simply said, "Let me run." Meaning, when I announce that I'm going running, I want his response to be, "Ok." Not "How about you go later?" or "Why don't you do this first?" Just "Ok." And he agreed. And after I return from Bloggy Boot Camp, I have one more trick up my sleeve. So stay tuned. I'm using this platform to hold myself accountable. And of course your fabulous ideas, tips, or suggestions are always appreciated! I think you hit the nail on the head with the part about working exercise into the daily routine, which involves cooperation from spouses/families. 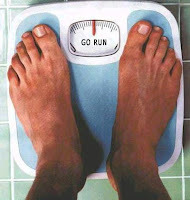 I think that is the reason most of us don't exercise regularly. It involves extra planning, something I'm not very good at! Good luck. I bet you will see great results! Ah! I just blogged about coming out of my winter blues...sorry to say, I did it with a wonderful feast! But, now, it's time to get back to the gym and get back to watching the calories! I'm looking forward to meeting you at BootCamp! I am so there with you on the eating more because of the exercise! I feel like I am starving all the time when I am exercising. People have told me to drink water when I think of food and it does nothing for me! Good luck lady and, hopefully, I will be on the bandwagon with you! Good luck! I'll be interested to hear about the cleanse. I've thought about doing something like that, but I'm a little scared. Can't wait to meet you this weekend! Great post! I will be following your progress! There is definitely a balancing act between exercise & diet! I love it, diet=weight, exercise=shape. Good luck with your running. You can do it and I can't wait to follow your progress. See you Saturday!! I've done the same thing in the past...workout - but eat more because I think I can justify it - never works for me either...sounds like you have a good plan though...good luck. Love your blog by the way..just started following. vewwy intewesting you twicky wabbit! Just in defense of yourself, when you exercise you ARE hungrier, because your metabolism kicks in. So it's not like it's your fault, you know? You can do it and sharing your journey in the social media space is a great idea. I've been trying to get healthy & lose weight since January and have found the online support I've received to be priceless. You can do it!! I, too, sadly, rationalize eating more b/c I worked out. What is up with that? I just started following, so forgive me if I'm a little behind!